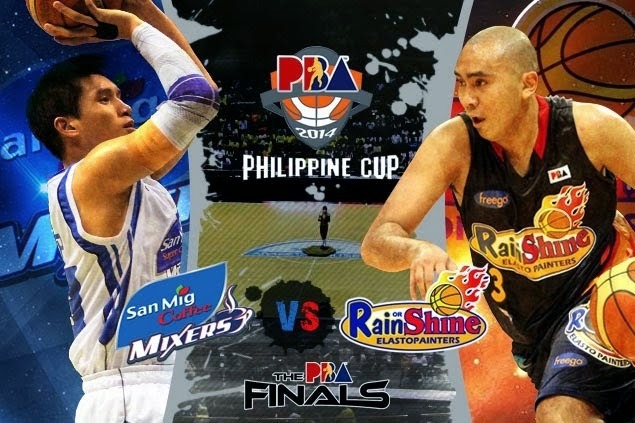 Live: Rain or Shine vs. San Mig Coffee Game 5 Updates, Scores - PBA PH Cup Finals 2014 - Balita Boss! The San Mig Super Coffee Mixers defeated the Rain or Shine Elasto Painter 90-93 during the Game 4 of the PBA Philippine Cup Finals to move within a victory to All Filipino Crown. Coach Yeng Guaio and the Painters are on the brink of elimination but still can pull off the upset and gave them the first All Filipino title. For Coach Tim Cone, he now has a chance to become the winningest coach in the PBA history with 16 titles if the Mixers win today. Rain or Shine wins Game 5. Chan fouled by Devance. Chan converts two FTs. Painters had some difficulties inbounding, calls another timeout. Yap misses three. Arana rebound. Painters timeout. 21.9 secs: Painters 24-second violation. Pingris scores inside, RoS lead down to 5. Chan hits turnaround fade-away jumper. Norwood makes three pointer to push the lead to five. 1:41: Mixers commits 24-second violation. Yap hits triple. Painters lead by 2 points. Belga splits FTs. Yap scores layup. Yap hits trey, cut down Painters lead to 4. Belga scores inside with reverse layup and-one but misses the bonus FT.
6:12: Lee misses three point shot. Chan is hot. He buries another trey. Chan again, scores three pointer. Chan scores again with a jumper. Mallari fouled by Arana in 3-point line. Mallari converts 2-of-3 FTs. Rodriguez puts back an Arana miss to end the quarter. Lee gets his 5th foul. He fouled Mallari. Mallari splits his FTs. Barroca pass to Pingris; Pingris scores slamdunk. Yap scores in transition. Ibanez answers. 4:50: Norwood attacks Barroca but blocked by Simon. Chan fouled by Yap. He makes two FTs to take the lead for RoS. 7:09: Simon misses layup; Chan also misses his shot. Chan makes two FTs to tie the game. Yap fouled by Norwood. He makes two FTs. Chan drives and scores layup. Cruz blocks Pingris. Cruz is down. 9:30: Mixers out of bound, last touch Pingris. Reavis fouled by Belga. He splits FTs. Norwood misses three pointer to end the 2nd Quarter. Yancy De Ocampo was fouled. He makes two FTs. Lee scores; Barroca answers with a jumper. Yeng Guiao slapped with a technical. Simon sinks technical FT.
Lee fouled by Barroca. He splits FTs. Araña fouled by Reavis (3PF). He misses both FTs. Araña drains floater. Rodriguez scores. Pingris escapes double-team, scores another and-1. Mark Barroca makes two FTs. Tiu hits trey, cut down the lead to 1. Mallari scores again in fastbreak. Another fastbreak points courtesy of Chris Tiu, plus foul. Tiu misses the throw. Almazan scores layup in transition. Mallari hits again, this time a three pointer. Norwood hits trey, cuts the lead to 7. Pingris escapes inside plus foul, pass from Devance. He completes and-one. Beau Belga fouled by Iang Sangalang. Belga splits FTs. Yap hits jumper, hand-off from Devance. Peter June Simon makes two FTs. Referee rule Yap triple earlier as only a two-pointer. James Yap and Joe Devance hits triple. Gabe Norwoods splits free throws. Paul Lee (3pts) hits open three pointer. Mixers win the opening tip.